For local advertising rates, contact Renee Williams at (502) 451-2430 or advertising@kentuckyliving.com. 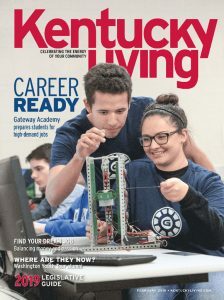 Published monthly for 70 years, Kentucky Living’s mission is to create a community of people who take pride in thinking of themselves as Kentuckians and as knowledgeable electric co-op members, in order to improve their quality of life. Features reflect the character and culture of Kentucky—its people, places, history, lifestyle and unique characteristics. Annual issues include college, lawn and garden, travel, home improvement, energy, and a focus on health. Regular departments include energy efficiency, book review, travel, outdoors, health, gardening, cooking and restaurant review.